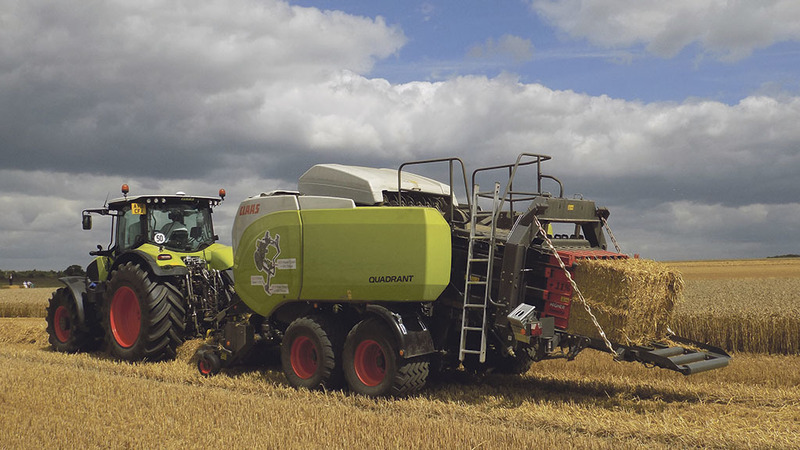 Following updates to its range of six-string large square balers, we try out one of Claas’ latest Quadrant balers. James Rickard takes the new 5300 for a test drive. 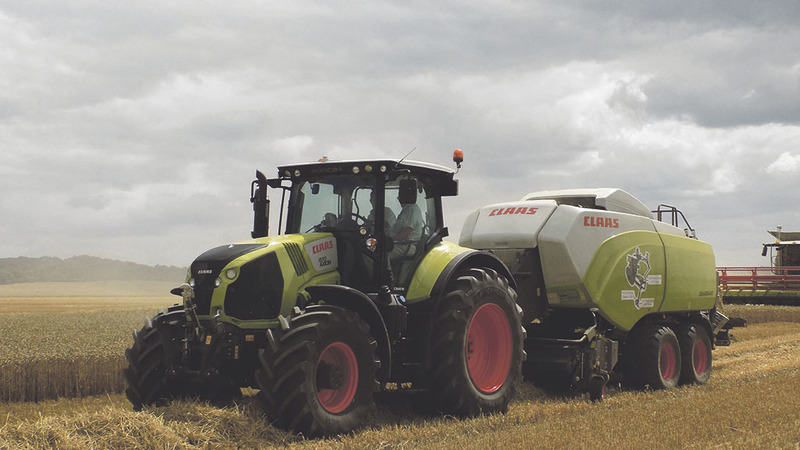 In a bid to boost performance and reduce downtime, Claas has heavily revised its range of six-string Quadrant large square balers, barring the flagship 3400. To see what impact these updates have had, we try out the largest updated model, the Quadrant 5300. Replacing the 3300, the 5300 produces 120cm by 90cm bales. Looking at the baler from the outset, you could be forgiven for thinking Claas has not really done much with the balers. Dig a bit deeper though, and it is a different story. Beefier knotters, uprated drivelines and easier density control are just a few of the highlights lurking beneath. 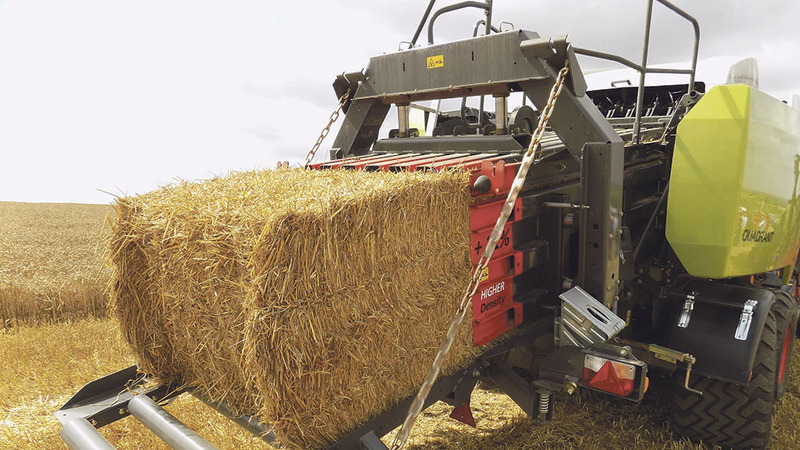 To find out how the baler performs, we headed to the fields of Oxfordshire and set it to work in some heavy 12-metre (40ft) swaths of wheat straw. 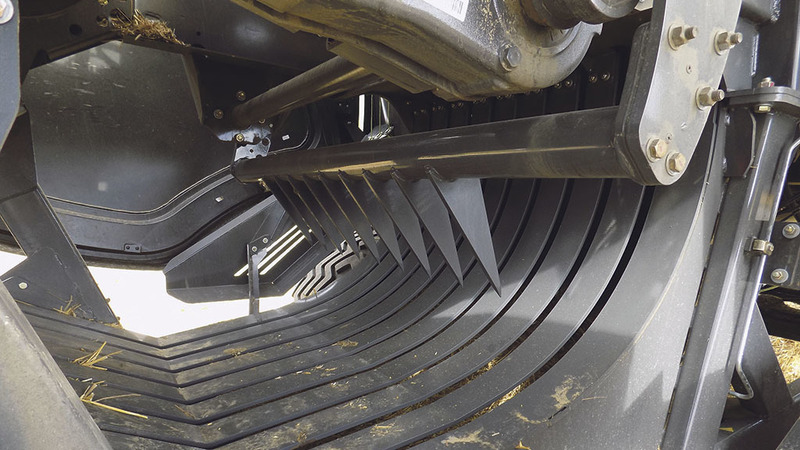 To handle more throughput, feed rotor speed has been upped 13 per cent, resulting in a noticeable increase in appetite. In addition, feed rotor and packer clutches have been uprated by 18 and 12 per cent, respectively, able to handle 9,200Nm and 9,500Nm of torque. Both clutches are oil immersed, with the packer clutch featuring a speed sensor. 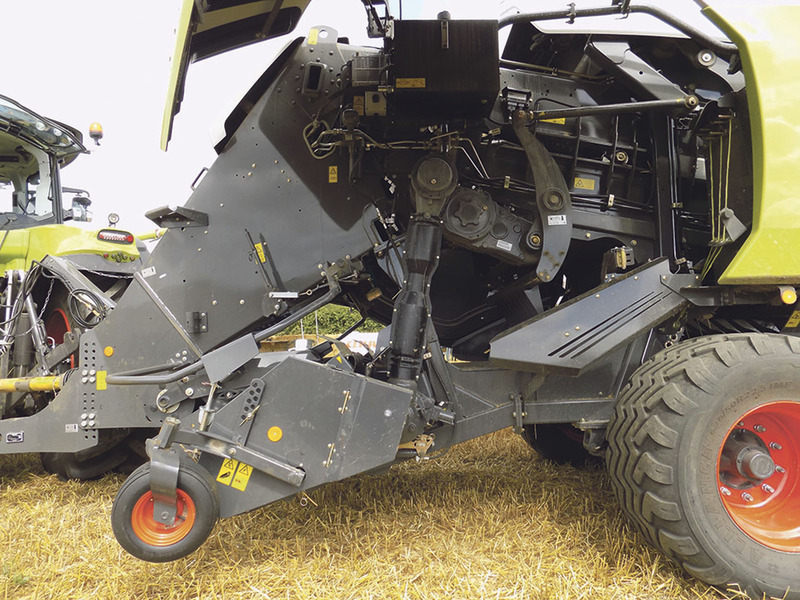 If it detects too much slippage as a result of being overloaded by crop, drive is disconnected to the packer and feed rotor, preventing damage. To resume work, all you have to do is keep the pto in gear, lower the revs, and wait for the torque inside the clutches to build back up again, which then re-engages drive, swallowing material. As we found out, it does work well. This gives you confidence to press on, not having to worry about breaking shearbolts, as used in other systems. You could argue that Claas’ shaft and gearbox-based powertrain could sap more power than chain driven systems, but this seems outweighed by the convenience of reduced overall downtime. In our conditions, working at 10kph (6mph), crop feed was good. The power feed auger in particular, which sits between the pickup and the main feed rotor, does a good job of keeping material moving. We can see this being an advantage, especially in short brittle crops, where material can often ‘stand’ in this area if it is not forced. Thanks to the baler’s guarding being set right back, you can see right into the main feed rotor, useful for gauging how much the baler can handle. There is the option of a hydraulically driven pick-up, with the second crop press roller and power feed auger also hydraulically driven. Using the tractor’s hydraulics, it allows pick-up speed to be tailored to the crop and enables the pickup to be reversed if a blockage occurs. The firm’s Rotor Feed non-chopping rotor is standard fitment. Various chopping options are available, including two integrated choices offering 25 or 51 knives, or an additional chopping unit which fits underneath the drawbar with 90 knives. This can work with either one of the integrated chopping options, offering a theoretical chop length of 22mm. To keep up bale density, pre-chamber pressure is variable. Using a lower and upper set of baffles in the pre-chamber, the lower set can be adjusted via the control box on the move, which determines how much material builds up in the pre-chamber. 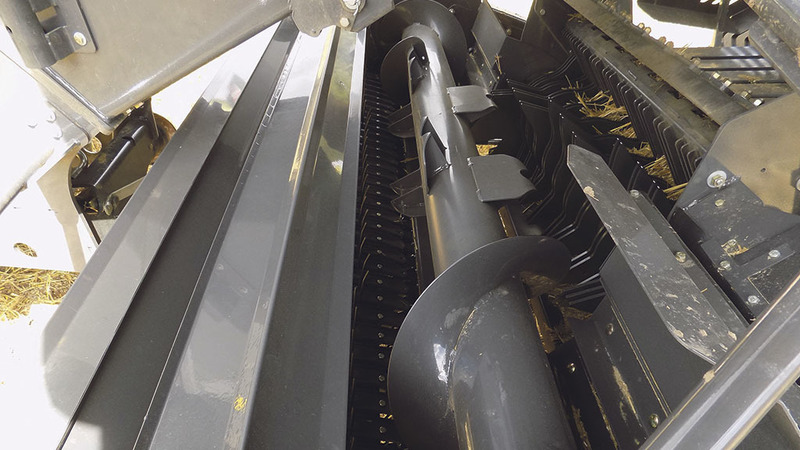 Material is fed into the pre-chamber via packer tines which can carry out up to five short strokes before a full stroke takes material into the main bale chamber. Once material reaches the upper baffles, these trigger the packer tines, regardless of which stroke they are on, to carry out a full stroke. In our heavy conditions, packer tines were carrying out a full stroke every other time. Improving bale density is the use of two larger diameter rams on top of the chamber, and an additional ram, now two per side, on the sides of the chamber. The chamber ring frame in which these rams are mounted is also beefier. To ‘grip’ the bale longer, therefore increasing bale density, the 53’s chamber has been extended by 11 per cent to 3.81m from 3.45m. Bale density can now be automatically regulated using the firm’s new automatic pressure control system. One of 10 settings can be chosen, with 10 being maximum density. 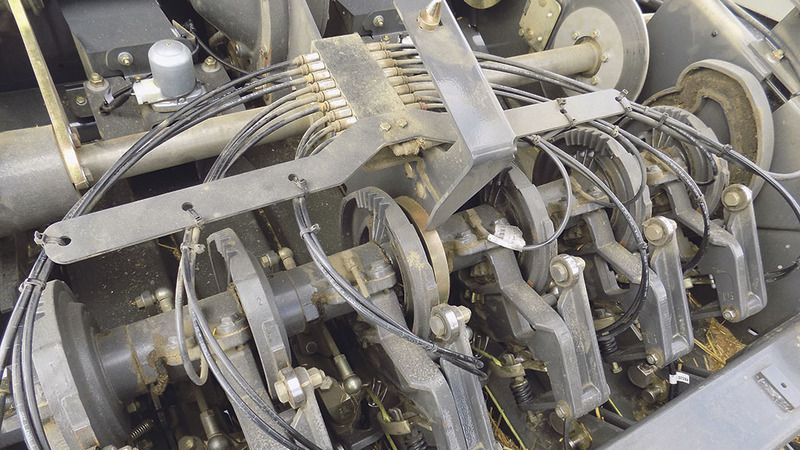 The baler then automatically regulates itself based on knotter tension using knotters one, three and six, and the ‘twist’ in the baler’s chassis, measured by strain gauges. Readouts on the terminal show how much strain each element is under. For our test, the baler achieved maximum density with hardly any strain on the knotters. If it was to be improved, the use of weigh cells would be good, allowing you to dial in a specific target weight for the baler to achieve. 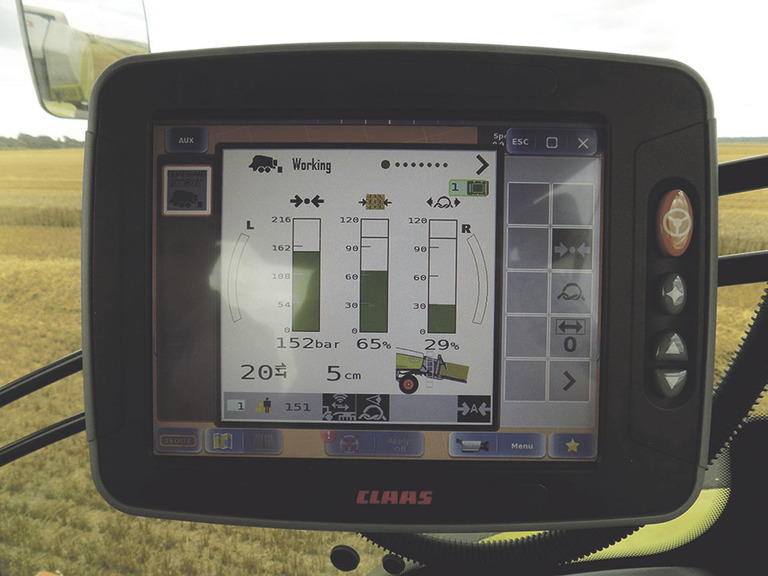 Claas says it is working on this with a solution coming soon, but up until now, the manufacturer has not been satisfied with any weigh cell system as they are not accurate enough. 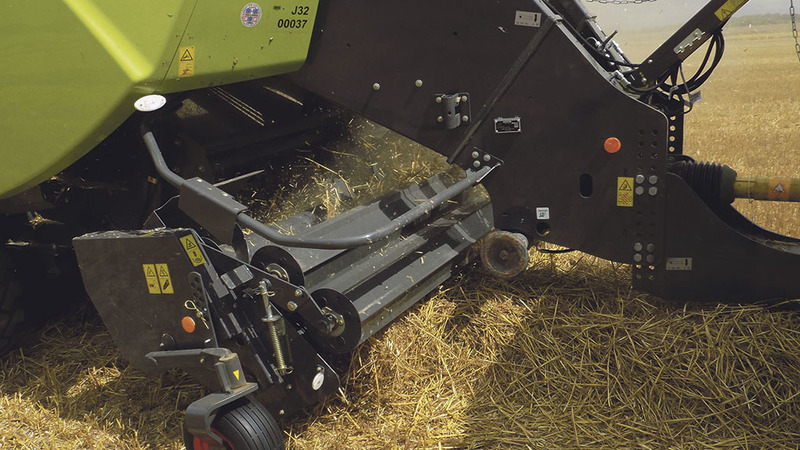 In straw, typical bale weights at maximum density settings have been about 450-500kg, says the manufacturer. On the day, using the farm’s weigh bridge, bales were averaging about 480-490kg. Standard on the 5300 is Claas’ new knotter control system; an alert system which informs you of knotter status. As well as knotter strain, it shows any missed knots, broken strings or clogged up knotters. If any of the above should happen, an audio and visual alarm warns the driver. It works too; in our case, detecting a loss of string due to dodgy tying between two balls of string. In effect, it acts as ‘virtual lollipops’. Knotter updates include a larger bill hook, with a tongue which opens up wider, giving it a better chance to grab the string, especially if the needle is out of alignment. String retention is also improved, thanks to larger diameter retainers, which now feature machined grooves for better ‘grip,’ especially for high tensile string. And when the string is being turned, the new knotters are said to be gentler on the string. Designed to last longer and keep their shape, twine fingers are beefier. Knotter casting is also larger and stronger, and the angle between bill hook and retainer has increased, resulting in a larger loop and tail being produced, which in turn is harder to pull apart. Knotter cleaning is now taken care of via hydraulically driven turbo fans venting air through two ducts which oscillate from side-to-side. Air is said to be a lot more focused and under higher pressure compared to its predecessor. It also blows further down the chamber too. For maintenance, knotters can swing upwards, making them much easier to get at. With 295hp coming from a Claas 870 Axion tractor, baler performance was good. The manufacturer says you could get away with 180hp, but you would not be setting any speed records. At almost 11 tonnes, before you put any crop through it, you really do need 200hp plus. We especially liked the overload protection clutches on the packer and feed rotor, giving plenty of confidence to push on. The new automatic pressure control system makes setup easier. A weigh cell option would be good which could tie into the pressure system for even easier setup, and it could be used for job documentation. String breakage alerts via the new knotter control system avoids embarrassment by not producing several bales with string missing. Overall, the updates are welcome additions, adding to the Quadrant’s capability.